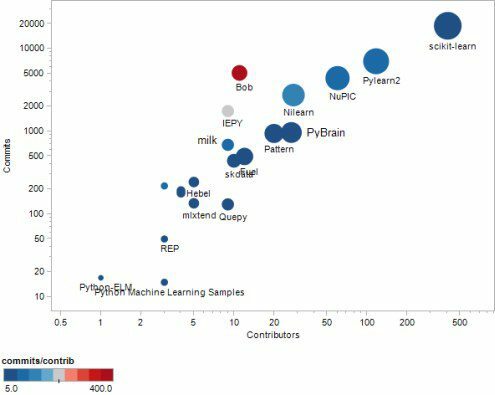 We analyze Top 20 Python Machine learning projects on GitHub and find that scikit-Learn, PyLearn2 and NuPic are the most actively contributed projects. Explore these popular projects on Github! Fig. 1: Python Machine learning projects on GitHub, with color corresponding to commits/contributors. Bob, Iepy, Nilearn, and NuPIC have the highest such value. Nilearn is a Python module for fast and easy statistical learning on NeuroImaging data. It leverages the scikit-learn Python toolbox for multivariate statistics with applications such as predictive modeling, classification, decoding, or connectivity analysis. PyBrain is short for Python-Based Reinforcement Learning, Artificial Intelligence and Neural Network Library. Its goal is to offer flexible, easy-to-use yet still powerful algorithms for Machine Learning Tasks and a variety of predefined environments to test and compare your algorithms. It's aimed at users needing to perform Information Extraction on a large dataset. scientists wanting to experiment with new IE algorithms. Quepy is a python framework to transform natural language questions to queries in a database query language. It can be easily customized to different kinds of questions in natural language and database queries. So, with little coding you can build your own system for natural language access to your database. Currently Quepy provides support for Sparql and MQL query languages, with plans to extended it to other database query languages. Hebel is a library for deep learning with neural networks in Python using GPU acceleration with CUDA through PyCUDA. It implements the most important types of neural network models and offers a variety of different activation functions and training methods such as momentum, Nesterov momentum, dropout, and early stopping. Its a library consisting of useful tools and extensions for the day-to-day data science tasks. A set of tools for creating and testing machine learning features, with a scikit-learn compatible API. This library provides a set of tools that can be useful in many machine learning applications (classification, clustering, regression, etc. ), and particularly helpful if you use scikit-learn (although this can work if you have a different algorithm). This is an implementation of the Extreme Learning Machine in Python, based on scikit-learn.